We were joyfully anticipating our marriage at St. Mel’s Church on Saturday, November 10. My birthday was on November 7th, so my groom surprised me with a dream come true – a week right on the beach in our first rental RV. I am an avid animal & nature lover & adore hiking and the ocean. We were to celebrate our honeymoon at the Malibu RV Park, and enjoy the earlier part of the week at Thornhill Broome State Park about 45 minutes from our home in Thousand Oaks, CA. We had a magical couple of days decompressing on the beach. Then, we received news about the massacre at The Borderline, which is a 1/2 mile away from our place. And then our neighborhoods began burning in the Hill and Woolsey Fires. On Thursday evening, we realized that Thousand Oaks was going to be evacuated. Being RV novices, we had kept my car with us to drive to the store and such. We jumped in my PT Cruiser and crawled through “rush hour” traffic to scoop up my wedding dress and Tom’s suit and get back to our safe haven at the beach. By the time we returned to Thornhill Broome, it had been evacuated. The entrance gate was locked, and the Park Rangers had left. Our RV was the only vehicle in sight – and it was locked inside the gate. The Santa Ana winds were gusting wildly, blasting us with sand when we tried to get out of the car. Tom is a modern-day Clark Kent, a mild-mannered gentleman, and a low reactor. My Clark Kent transformed into Superman in that moment. He jumped out of the car, climbed the fence in the sandstorm, and freed our RV through an unlocked exit (the kind that destroys your tires if you try to enter through it.) Tom drove up beside me and gave me the thumbs up! Mission accomplished! We had no idea where to go and decided to head towards Malibu on Pacific Coast Highway. Noticing several RVs parked on the side of the highway at Zuma Beach, we pulled up behind them and went to bed. The next morning, we woke up in clouds of dark smoke from the melting nearby canyons. Once again, we had no idea where to go. We prayed for guidance as Tom led our mini-caravan towards Santa Monica, hoping to escape the giant flames blowing down the canyons towards us. PCH was a parking lot. If the fires kept picking up speed while we just sat there, we would be toast. I called Tom and asked him to make a quick right towards Westward Beach, a small peninsula not yet engulfed by smoke. We joined the small crowd standing in the sand staring at the nearby hills on fire. The sun looked like a big red ball through the huge dark clouds blowing our way. All the canyon roads out of Malibu were on fire or closed. PCH was the only way out. A woman told us her friends had just tried to evacuate to Santa Monica and had only gone 1 mile in the past 3 hours. 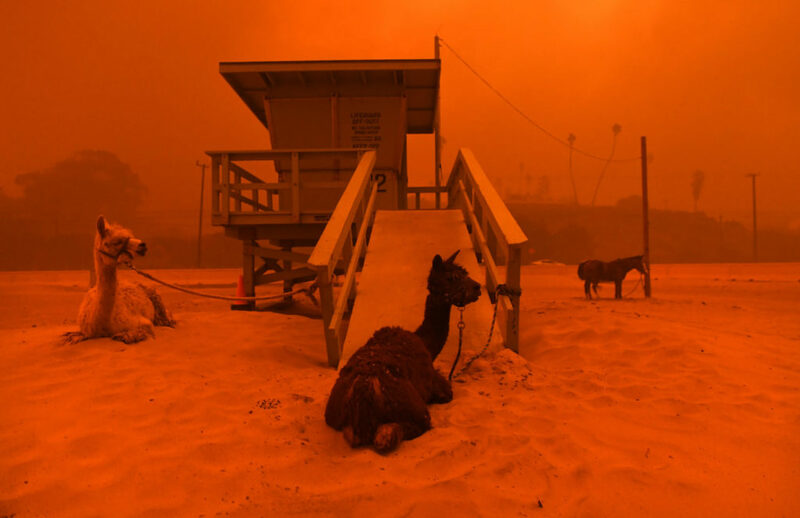 A couple of lifeguards drove up and suggested we drive back to Zuma, where they had started a makeshift evacuation center for humans, horses and pet llamas in the parking lot. I mentioned the dense smoke at Zuma. They agreed, but said the wider beach there may be safer, since sand doesn’t burn. The lifeguards told us we could also stay put – it was our choice. One of them warned, “If you see flames coming over the cliff here, run as fast as you can into the ocean.” Then they drove off. The ocean was our evacuation route. Tom grew increasingly uncomfortable with the thickening clouds of smoke enveloping us, ocean or no ocean. We drove up to the cliffs above us at Pt. Dume and parked the RV & my PT. The residents we met there seemed confident we could weather the firestorms from the safety of these cliffs and its beach far below. After all, their homes had been spared during previous fires. Gladly – where? 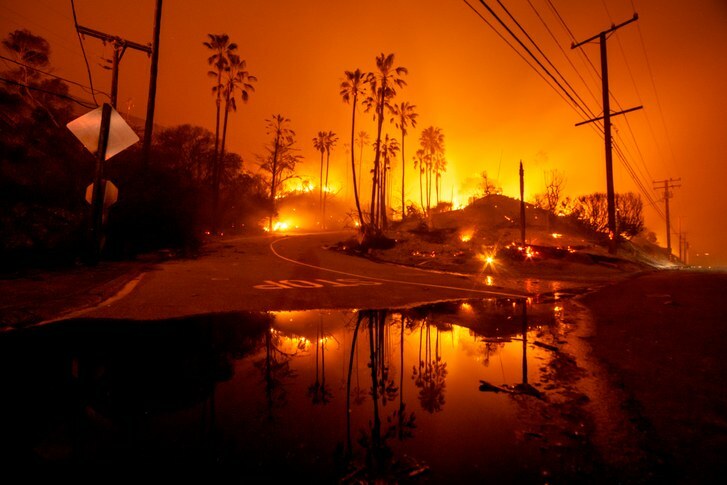 We had been advised that Santa Monica had closed its entrance ramps because it had received too many evacuees and was concerned about traffic issues – not very neighborly when the town next door is literally on fire. We pulled into a couple of empty spaces at Ralph’s parking lot across from Pepperdine University. The lot had become another makeshift evacuation center. Electricity and cell service were down in Malibu so it felt eerily dark and quiet. I was very grateful to see people had brought their pets with them. We bumped into the Malibu RV Park owners who had also evacuated there. We told them we had reservations for our honeymoon there in a couple of days. They gently advised us to find a Plan B. Sadly, the Malibu RV Park burned to the ground, as did many of the homes at Pt. Dume, along with many thousands of other homes in California. 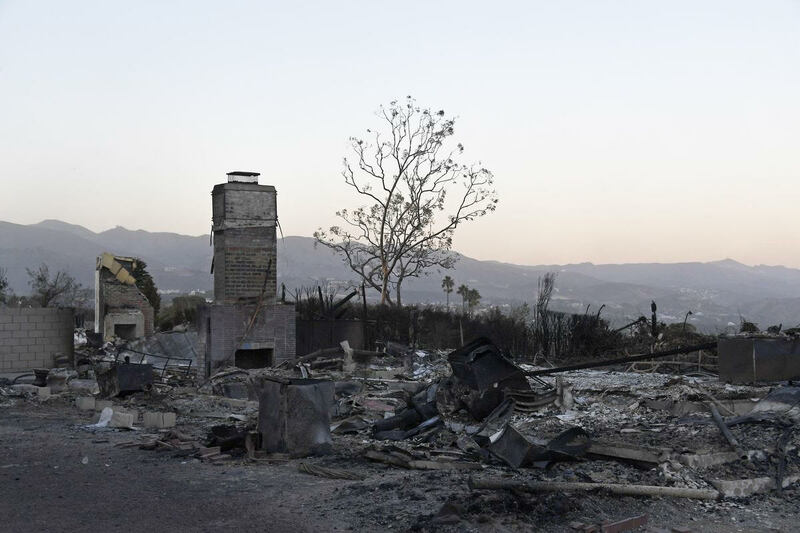 A mind boggling eight-six percent of the “federally protected” land within the Santa Monica Mountains National Recreation Area was decimated by the Woolsey Fire, according to the National Park Service, along with our state parks, hiking trails and most importantly, animal habitats. Last year’s Thomas Fire was confirmed to be caused by the utility company’s infrastructure issues, for which there are class action lawsuits against them. This year’s devastating CA Wildfires were ignited once again by the utilities. 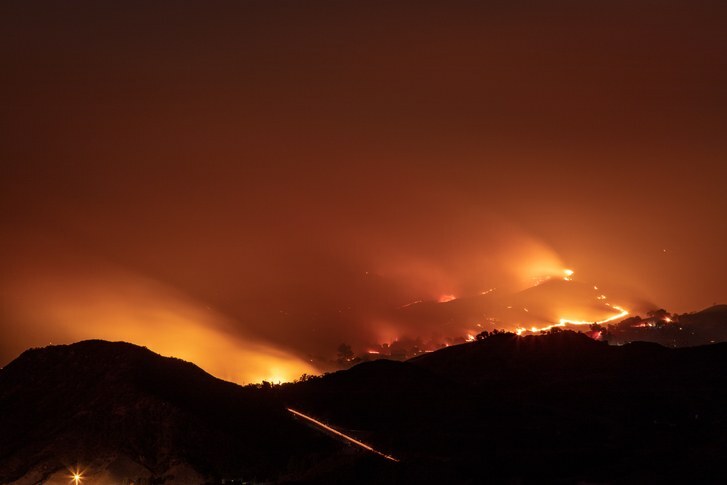 As an example, Southern California Edison reported a “disturbance” in a circuit as well as outages near the Woolsey fire just two minutes before the fire sparked there. SCE submitted a report to the Public Utilities Commission to alert it to the events. A new round of class action lawsuits has begun. Disturbingly, the utilities can make up for all of the losses they created by simply raising our rates. 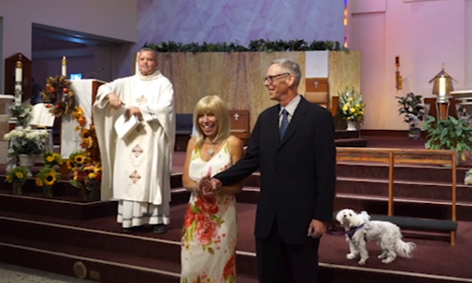 As it became increasingly difficult to breathe through the smoke on Friday, we decided to see if we could drive the long way around to St. Mel’s Catholic Church in Woodland Hills, where we were still hoping to get married the next morning. Woodland Hills was not on fire but the 101 freeway & PCH were closed. We also needed to get cell service so we could confirm that our wedding was still on, and update our guests. We started singing, “I’m getting married in the morning…So get me to the church on time!” from “My Fair Lady” and began our exodus. It took a couple of hours instead of the usual 30 minutes to get to the church, but we got there! With cell reception, text messages started pouring in. Our dear friend who had planned to host our wedding reception at her beautiful home in Bell Canyon had been trying to reach us. Her home had just burned to the ground. Half of our wedding guests had been evacuated, the 101 freeway and PCH were closed and our honeymoon RV resort was in ashes. Tom had taken a week off from work for my birthday and our wedding, which was not an easy feat. It would be a logistical challenge to postpone and reschedule our nuptials. Well, God showed up! Father Steve and staff members at St. Mel’s freed up “Serenity House,” an adjacent meeting house next to the church, for our reception…AND for our honeymoon! We are the first (and probably the last) newlyweds to ever honeymoon at St. Mel’s Catholic Church! Our friend who had just lost her home still showed up to be of service at our wedding! She even had the presence of mind to ask her caterer to deliver the main dishes to St. Mel’s instead of to her home. Amazingly, she had also stored our reception decorations in her car, which her son had managed to rescue from their driveway before the house went up in flames. She came to the church on Saturday morning with an iron she had borrowed from their hotel room, along with her tablecloths and decorations, and got right to work decorating Serenity House while we set out the food, drinks and cake! Tom and I did a quick change into our wedding clothes in the RV. I put a bow on our ring bearer, our Maltese dog, Hope. Hope is a regular at St. Mel’s. A true pack animal, Hope gets distraught when she is alone. Tom and I joke that we are her “service humans.” The three of us ran into the church. I had written a wedding song, “Always,” which Tom and I sang a Capella together after taking our vows. Pulling that off felt like a real miracle! As Oprah says, “This is what I know for sure.” The power of Love is greater than the wildfires or the utility companies. Amen. To your very happy health!